Welcome to explore pioneering PropTech companies from the Nordics as part of New York Real Estate Tech Week! Don’t miss this opportunity to meet a variety of companies providing products and services from e.g. IoT to indoor air solutions and VR technologies. In order to innovate and grow in today’s fast-paced and competitive marketplace, organizations must draw from a diverse range of experiences, thinking, and perspectives. KPMG LLP (KPMG) and the members of the KPMG Women in Real Estate Steering Committee invite you to join distinguished industry leaders on November 7, to discuss the development and empowerment of women in real estate. Join over 300 of your peers this November 7 - 8 to discuss the future of private real estate investments with the key players driving the industry. MIPIM PropTech NYC is the world’s leading real estate technology event co-hosted by MIPIM and MetaProp NYC. We gather key real estate decision makers from all the value chain to connect with cutting-edge startups and technology companies to take their business to the next level and build the future of property. 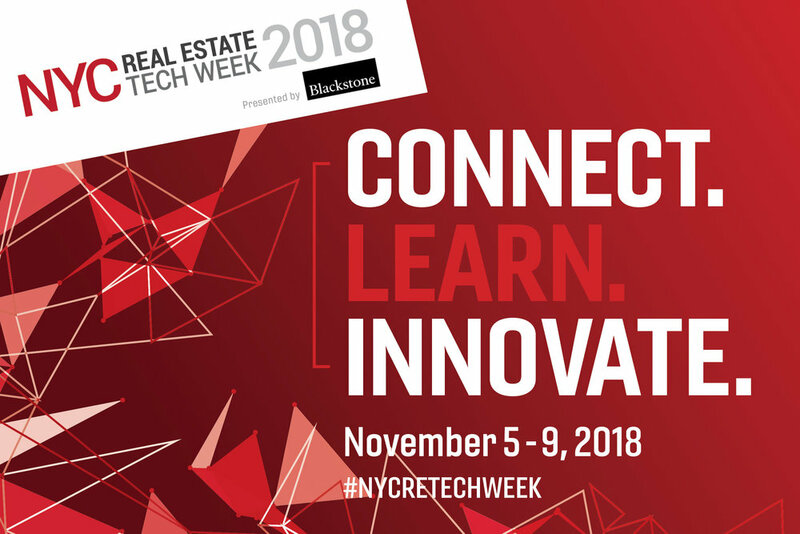 NYCRETW 2018 presented by Blackstone features 12 real estate technology events - including the flagship event MIPIM PropTech NYC - and an estimated 2500+ attendees from more than 30 countries. From panels and roundtables to startup demos and professional education sessions, attendees can expect an unparalleled, jam-packed week of PropTech action. The Realcomm CIO Forum series is open to CIOs and other senior IT professionals in the commercial real estate development, REIT, owner, brokerage, investment management and related service industries in selected markets globally — New York, Sydney, Toronto, London, Chicago and San Francisco. New York has now hooked its economic future to the tech sector—the most dynamic aspect of the American economy—and is emerging as the second headquarters of the whole industry. AEC Tech 2018 is the sixth annual event and a four-day experience for professionals in the AEC industry produced by Thornton Tomasetti and CORE studio! The 2018 theme, Interpolations, focuses on the injection of innovative processes, technologies, and workflows that are rerouting the way the industry works, designs, and thinks. EXPO REAL, the international trade fair for real estate and investment, is the unmissable business platform for the entire sector – all in one place. InnovateCRE is a global community that serves as a catalyst for new ideas, trends and transformative changes in the real estate space. In it's 2nd year, InnovateCRE is going beyond the headlines and looking at the next wave of transformational trends. FlexOffice 2018 brings together two organizations for one landmark event. NAIOP, the Commercial Real Estate Development Association, and the Global Workspace Association (GWA), are bringing together a dynamic group of owners, operators and developers of office space to explore a diverse range of topics on cutting-edge office trends and technologies. RETHINK Office of the Future offers opportunities to learn and connect through a variety of panels, presentations, keynotes, Q&A, workshops, private roundtables, one-on-one meeting software, site tours and VIP functions. The business of commercial real estate is moving beyond fear of the unknown into a new era of empowerment. Join trailblazers in investment, brokerage and management to explore how emerging technologies are totally reshaping the business of commercial real estate and the future of the built environment. Coffee and breakfast will be provided while you network and learn from some of the smartest technology and real estate experts. You'll come away from this special event with valuable new connections, actionable insights and real empowerment! MIPIM Proptech is the premier Property and Tech event in Europe gathering key decision makers from all sectors and technology companies to take their business to the next level and build the future of property in the European Market. #BitcoinCRE attracts the best minds in the blockchain and real estate space. Venture Capitalists, Startup Founders, Academics, Government Officials and Blockchain Enthusiasts come together to share their thoughts on how blockchain and cryptocurrencies are reshaping the real estate landscape. 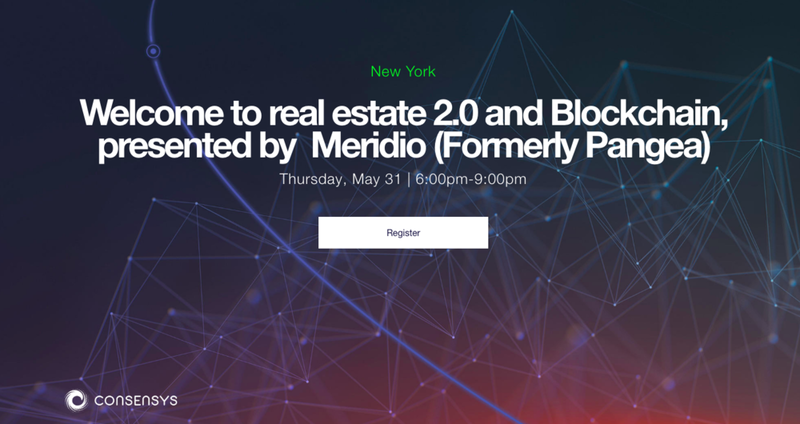 Welcome to real estate 2.0 and Blockchain, presented by Meridio (Formerly Pangea). This event will focus on the future of real estate and tokenization featuring speakers and panelists from ConsenSys, Meridio, Colony NorthStar, and Cayuga Capital. We will discuss emerging business models in the real estate space, asset backed tokens, regulatory hurdles for tokenized securities, and the benefits of fractional ownership. We will also provide a sneak peak into the Meridio platform and formally announce rebranding from Pangea. Join us for a panel discussion about the opportunities and challenges presented by the Greener, Greater Buildings Plan and the legislative proposals that are expected later this spring—and to learn about some of the most exciting technologies and ideas that are helping property owners meet their efficiency goals. The entire real estate sector is at a critical crossroads, where technology is now relevant more than ever. The organisations that can adapt to these changes will emerge as the winners. Our platform allows you to understand these changes, meet the thought leaders, find strategic partners and secure new customers all around the topic of Digital Transformation in real estate. Join us for the Spring RETS Meetup focused on Rental Tech, our 2nd themed event this year. We have a keynote, panel and demos in store for you + tapas and beer. ULI Washington Real Estate Trends Conference is a one-day deep dive bringing together 25+ top industry experts to discuss the most current local and national real estate trends, with a focus on what to expect in the future, where the best opportunities can be found. MetaProp partner, Zak Schwarzman will be a keynote speaker at the event. As a proud partner of Connect NY on April 17th, MetaProp’s Phil Russo will be moderating a special panel, Reinventing The Modern Office. Join us and 200+ of the most active players in the NY commercial real estate market for an afternoon of high-level panels, endless networking, a cocktail reception, special awards presentation, and more. Receive a 20% discount on your registration when using the discount code metaprop20. Register online now or contact Emily Lettieri at elettieri@connect.media or (914) 391-2733.